COMING SOON! Renovations underway and to be completed in the coming weeks at which point listing will be accompanied by new photos. 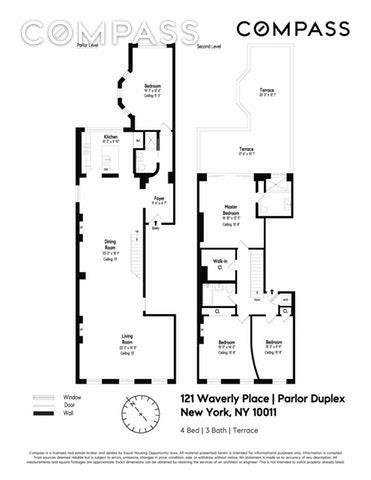 Buyer has the opportunity to choose certain details and finishes until completion.121 Waverly Place is a duplex residence located in an historic pre-war 25 wide townhouse on one of the most sought after streets in Greenwich Village. This newly renovated, 4-bedroom, 3-bathroom home occupies nearly 3,000 square feet across two full floors and boasts a sprawling, private terrace. The vision of the space was curated by a world-renowned fashion designer and no detail was spared with the level of materials and craftsmanship. The dramatic 13 ceilings of the parlor floor are accentuated by the recently exposed original wood beams. The space exudes a modern, clean lined aesthetic, yet still retains stunning pre-war details throughout. The 48 long great room features exposed brick walls, enormous windows, and two fireplaces (one wood-burning, one gas) with their original ornate cast iron surround and mantels. This loft-like grand room provides the perfect space for casual living or extraordinary entertaining. Hidden behind exposed brick columns at the back of the living area is a brand new, modern chefs kitchen with dark wood cabinetry, gray Carrara marble counters, and top-of-the-line Bosch black matte appliances. A large window was added to this space to provide an abundance of natural light and overlooks the courtyard below. Also on this level is a large bedroom that could also function as a library, home office, or den, and a stylish full bathroom adorned with gray Carrara marble. Up a beautifully appointed staircase off the great room is the bedroom floor. Two spacious bedrooms share a curved architectural wall that allows for a more natural flow and a whimsical break between the spaces. Off these two bedrooms is a fully renovated bathroom which features gray Carrara marble countertops, hexagon patterned floors, 18 x 24 marble tiled walls and a tub. A luxurious bright and airy master suite features exposed brick and access to a massive, private terrace with a new railing and Ipe wood decking. The windowed, en-suite master bathroom has those same high-end marble finishes, a spa-like oversized shower, and large window overlooking the terrace. There is a large walk-in closet that provides an abundance of storage. Other noteworthy features of this home include pre-wired smart home technology, a total of three fireplaces (two working), exposed brick, 8-inch Italian white oak wood floors throughout, and suburban sized, vented washer/dryer. The tasteful renovations and unparalleled attention to architectural detail throughout provide for a pre-war home with all the conveniences of modern, luxury living. Located on a quaint, tree-lined street just off Washington Square West, 121 Waverly Place is moments from Washington Square Park and close to some of the citys best dining and shopping experiences. Just across the street is the famous Italian restaurant, Babbo and a block away are some of Greenwich Villages most iconic buildings. Buyers looking to own to own a "modern piece of history in downtown Manhattan will not want to miss out on this once in a lifetime opportunity.